Never, ever complain or worry about a dry late winter and early spring. We’ve probably all done this and perhaps still do, but more often than not Mother Nature evens the score in May and June. In some areas during 2017, the softball league slaughter rule has already been invoked, or at least it should be as rainfall (and snow) has been relentless. In many other regions, it’s just been too wet. As of this writing, it’s too early to know how many more cattle died in the raging snowstorm that struck areas of the Southern Plains. Feedlots were hit particularly hard with estimates of up to 75 percent of U.S. cattle on feed impacted by the storm. Rain preceded and followed the snow, making conditions especially rough. If that’s not enough, the region is still recovering from widespread wildfires. Though copious amounts of snow this time of year are never welcome, neither is torrential rain. 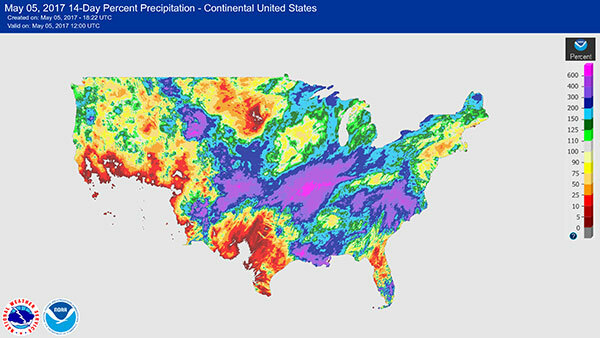 Many areas east of the Rocky Mountains find themselves in a moisture surplus situation; some have received up to six times or more their normal precipitation over the past few weeks. The epicenter for this rain seems to be Missouri and nearby neighbors, though excessive rainfall has also been received in other areas (see below). Widespread flooding and structural damage has occurred. Millions of acres of pasture and hay are being impacted and in some cases were at or near the time for harvest. Forage plants that remain under water for several days to a week will be severely damaged and likely lost. Short-term standing water also will present challenges, but over time may be salvageable. Consider any already harvested hay that was subject to standing water a total loss. Feeding such hay to livestock carries considerable risk. Any field that is saturated for an extended period of time is prone to soil compaction issues from grazing livestock or harvest machinery. Further, soil microbial activity and health is severely impacted, at least in the short term. Totally submerged hayfields and pastures are the worst-case scenario and may have a plethora of debris that floated in on the standing water. Depending on the nature of the debris, harm to livestock and the potential for damaging machinery exists. It’s always prudent to check these fields before returning livestock to pastures or cutting for hay. Forage in flooded fields will also be silt covered. This adds to plant disease potential, reduces palatability, and may significantly add to the ash content of any harvested forage. The higher levels soil on the plants may be especially problematic for horses, which don’t tolerate high levels of sand in their diet as well as cattle. If possible, delay cutting or grazing forage after it’s been flooded. New growth will help dilute the ash content, and subsequent rain showers will aid in washing off some of the silt. Further, undesirable microbial contamination will diminish over time. For pastures, monitor legume growth following a short-term flood event. Heavy silt deposits will likely reduce legume densities, especially for species such as white clover. There may be a need to re-establish legumes next spring. Conversely, weed densities and species may proliferate. Floodwaters can easily bring new, undesirable plants into pastures and hayfields. By nature, alfalfa is not a wet-soil plant. In my experience, the ensuing results from flooding or long-term saturated soils are generally not good. 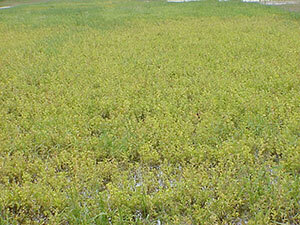 Initially, alfalfa will turn from green to yellow as nitrogen fixation ceases and the plant becomes nitrogen deficient. 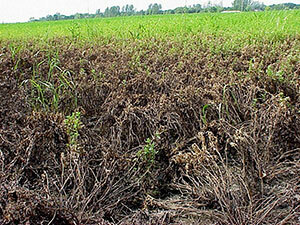 If standing water remains for too long, the plants will eventually turn black and die. Saturated soils are also favorable for the development of diseases such as phytophthora root rot. Where alfalfa stands do survive, they may initially lack vigor and it will take time for populations of rhizobium bacteria to build in the soil. Fields will also be subject to rutting and compaction in the short term, further lowering subsequent productivity. Even in a best-case scenario, harvest may have to be delayed and forage quality will be poor. This forage needs to be segregated and not fed to high-demand livestock that are growing or lactating. The decline of forage quality and reduced animal performance is often one of those “hidden” losses that occur in the wake of a weather disaster.